Posted on November 8, 2018 by Mirabella S.
Have you ever wondered what it would be like if your family left behind everything you knew and moved to a remote African village? Probably not, but that is the scenario that the Price family faces as they embark on their missionary trip to the Congo in Barbara Kingsolver’s novel, The Poisonwood Bible. There are five members of the price family. Nathan Price is a firm willed Baptist pastor, determined to right the “evils” of Africa. Orleanna is Nathan’s wife, and is lost in the identity of her husband. Their daughters, Rachel, Leah, Adah, and Ruth May each react to their new home in different ways- and to the tragedy which soon befalls them. The family gets more than they bargained for when their Baptist evangelist mission is swept up in the Congolese revolution, and the government- and their world- falls apart around them. The Poisonwood Bible deals with a topic that is all too often glanced over in modern society: the effect of European colonialism. The Congo that the Price family visits is broken politically and economically. Additionally, it explores the idea of gender through Orleanna, who has lost her own identity and lives for her husband instead. The idea of voice is also thoroughly explored by Kingsolver, who rotates the book’s narration chapter by chapter. Sometimes the story is narrated by materialistic Rachel, other times by dedicated Leah, sometimes by five year-old Ruth May. The only member of the Price family who does not narrate is the father, Nathan Price, whose character can be vividly constructed through the insight of all of the Price women. Because such a diverse cast is narrating the story, not only is the book engaging, the reader is able to see every facet of the trials of the Prices in Africa- and see how each character reacts to a tragedy which befalls them, whether that be through denial or guilt. This book is so valuable, and reading it is an experience in itself. I would recommend this book to anyone who wants a good read that is steeped in nuance and artfully written, in which political and religious references abound. 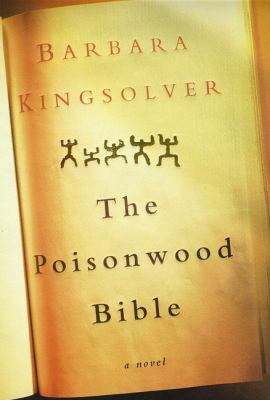 The Posionwood Bible by Barbara Kingsolver is available for checkout from the Mission Viejo Library. This entry was posted in Book Reviews and tagged congo, democratic republic of congo, families, missionaries by Mirabella S.. Bookmark the permalink.